It’s not rare to have a jumpy lower eyelid when tired. It comes and goes, it’s upsetting when trying to read or when talking to somebody; it’s worst when drinking too much coffee, lacking of sleep or being under pressure. It’s called Benign Myokimia and it usually disappears without any treatment after rest and relaxation. Don’t hesitate to talk to your GP if it persists. Less commonly the twitch in the eyelid continues and spreads to the upper lid with a tendency to close the eye. It also spreads very gradually to the cheek, and to the corner of the mouth, which starts twitching at the same time. The person looks like winking to somebody with the sudden eye closure and the cheek pulled up. Of course it’s very embarrassing in public and can lead to some misunderstanding! It interferes with daily life activities like reading. Patients find very tiring to cope with the facial spasm every day. It is worst when going to bed and falling asleep. Every muscle on one side of the face can be jerky from the forehead (Frontalis) muscle to the muscle of the skin of the neck ( Platysma). Patients often are embarrassed when meeting people for the first time. It’s more than a wink! 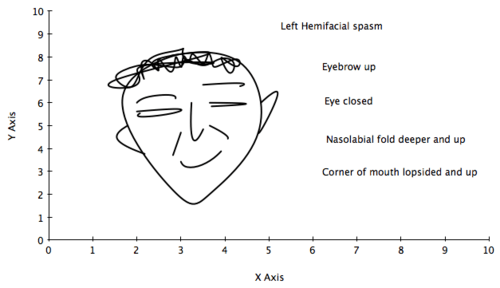 The diagnosis of hemifacial spasm is not always easy! The spasm is intermittent and often not present during the clinic, like the toothache disappears when sitting in the dentist ‘s chair! The trick is to stretch the muscles of the face to trigger the facial spasm; I ask the patient to do a forceful smile or to close very tight the eyes for few seconds; following these stretches, the facial muscles start to jump on one side of the face. The diagnosis is then much easier for the doctor. Why one side of my face is jerky? The facial muscles on one side become too active, due to an irritation of the facial nerve on the same side. The irritation is most often due to an artery, which forms a loop and rubs against the facial nerve. Botulinum toxin injections are indicated at the first line treatment for hemifacial spasm, as the side effects are very limited and always transient. The results are very good in 80% of the cases. The limitation of the injections is the necessity to repeat them every 4 months and the difficulty to control severe spasm around the mouth without changing the smile. The surgeon can put a pad of Teflon between the vessel and the nerve to separate them; this surgical treatment calls vascular decompression and is performed by neurosurgeon, trained in this type of surgery. It is usually discussed after having tried Botulinum toxin treatment. Next Article Botulinum toxin has transformed the treatment of focal dystonia.